10 November 2017, at 12:00a.m. 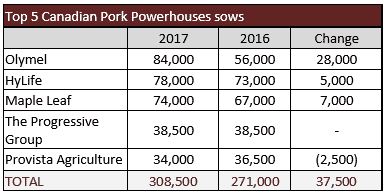 Successful Farming (agriculture.com) recently released its Pork Powerhouses, which included the top five Canadian producers. As seen on the table below, the top five have 308,500 sows, up by 37,500 compared to last year. Canada as reported by StatsCan on July 1, 2017 has a sow inventory of 1.3 million sows. That places 23.7% of the sows with five entities. This would approach the type of concentration we’re seeing in the US with their Pork Powerhouses. Also, the top three are packers and primarily packers. Olymel & Maple Leaf are Canada’s two largest packers and probably is fair to say only came to pork production as they say, “with necessity being the mother of invention”. That is they’re in production as much to secure supply for their packing plants as a desire to be in the production side of the business. This is probably particularly true of Olymel who acquired Big Sky, Humbolt SK (26,000) and Puratone, Niverville MB (25,000) in recent years and Pinnacle Farms, Calgary AB (6,000) in 2016. Big Sky and Puratone (former Pork Powerhouses) were in tough shape financially and at risk of being acquired by a competitor or disappearing all together. Either way the supply is lost for Olymel’s plant in Red Deer AB. Hence necessity causes Olymel to become a significant player in pork production in Western Canada. From there for a corporation once you’re in a business you either need to get good at it and grow or get out of it. Olymel clearly has opted for the former with the acquisition of Pinnacle and their project in the northern Quebec region of Abitibi-Témiscamingue. The plan is for five barns of 2400 sows for a total of 12,000 sows. There are now two farms in operation and a third one is under construction in the region to fill in the New Year. The fourth barn will begin construction in the spring. This rounds out approximately 30,000 sows Olymel has in Quebec in partnership with producers with varying amounts of ownership. The situation with Maple Leaf is unlikely significantly different with their driver to be in pork production being to secure supply for their Brandon MB plant. Arguably the roots of their pork production came when Maple Leaf owned Shur-Gain and Landmark feed businesses, where Landmark particularly had grown into pig production to secure feed tonnage. However, with Maple Leaf’s divesture of Shur-Gain and Landmark to Nutreco the interest in feed tonnage no longer was a driver. However, supply for the packing plant certainly was. Every packing plant understands running under capacity with huge capital costs and traditionally tight margins isn’t a recipe for success. Finally, HyLife isn’t particularly different. Although they integrated from the other direction, that is started as pork producers and integrated up with the acquisition of the packing plant in Neepewa MB, they’re now very much packers first, pork producers second. Therefore, I would fully expect their pork production plans are driven by requirements of the plant rather than any particular desire of the production end to just decide to have more sows. One could begin to feel with these trends there may be no room for a producer who is not integrated to a packer. Although there seems to be increasing truth to this, there are a host of ways to being integrated to a packer without full ownership by the packer. I believe it’s fair to say packers have no burning desire to be in pork production. First, it’s not their core business and second they’re arguably not particularly good at it, probably because it’s not their core business. Challenging to be very good at one thing let alone two. In addition, the capital requirements of pork production as opposed to slaughter is approximately ten to one. Is this where a packing plant wants to tie up their capital? Probably not if they don’t have to. 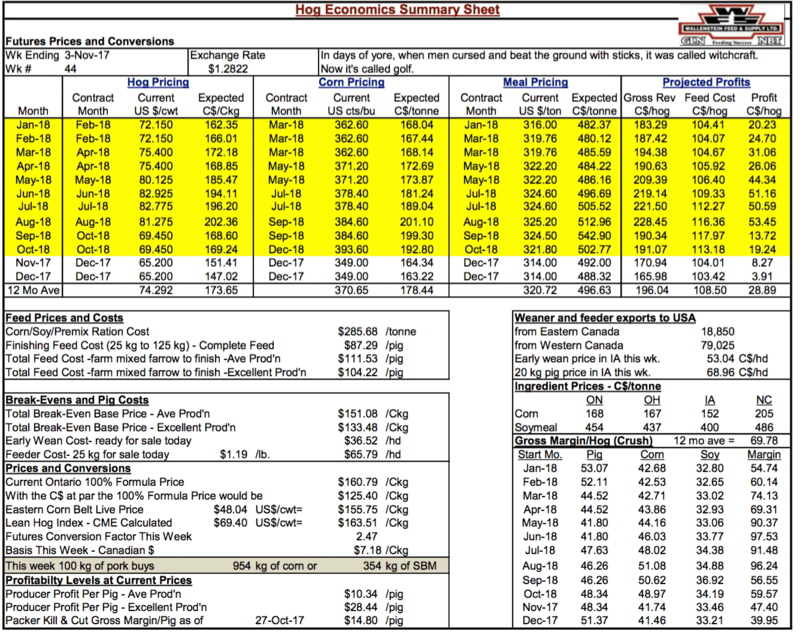 Hog profitability has shifted significantly in the six weeks since my last commentary. Here courtesy of Bob Hunsberger, Wallenstein Farm Supply. Projected profits currently for the next 12 months are $28.89 on average and a nice recovery from the $8.68 of my last commentary. Also, present margins with average production have recovered from a low in the red the week of September 29 at ($30.62) to $10.34 (hopefully marking the bottom as now behind us) and with excellent production from a low in the red the week of September 29 at ($12.82) to $28.44 from last commentary. Packer kills & cut gross margin although trimmed still stands at $14.80 that should very much keep them in the hunt. This will mark a fifth straight year of profitability an unheard-of occurrence in this industry. Probably more amazing is the relatively stable production in response to it. This is probably for a host of factors not the least of the changing face of the industry just discussed. As noted, Ontario producers are estimated to have moved into the red since roughly the start of September. That is likely the case for producers across the country. Of course, it is not unusual for producers to see negative margins starting in September, but it is a little earlier than average. From 2000-2015 Ontario producers have on average seen red ink beginning in week 43, which is mid-to late October. That is, according to data compiled and analyzed by Bob Hunsberger. Last year though the red ink also began in September. While the red ink may have started a little early this year, Hunsberger’s data shows that during the first three quarters of 2017, profits have averaged $35/head. That is compared to $23 last year for the first three quarters and $9 for the 2000-2015 Q1-3 average. Last year margins were in the red by $17/head in the fourth quarter. That compared to losses of $5/head for the 2000-2015 average. The final graphs in this report examine profit prospects for the coming months. The main point though is that the year is likely going to be much better than 2016 but not quite as good as 2015. Of course, there will likely never be another year like 2014 given the US PED problems. Anonther way to look at 2017 is that it will be the 5th straight yearof profits, which is something that is unheard of in the industry. For their part, packers too will enjoy another good year in 2017. Packer profits in both Canada and the United States have been very good for an extended period as well. In fact, the string of excellent profits is the key reason for the expansion of packer capacity in the United States. The unique angle in the U.S. is that it is producers that are driving the expansion of packing in order to garner some of those packer returns.